The Mystery of the World's Most Expensive Wine In 1985, a single bottle of wine purported to be from Thomas Jefferson's own cellar was sold at auction for $156,000. 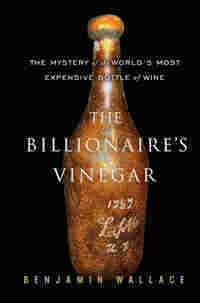 Benjamin Wallace traces the mystery surrounding the bottle in The Billionaire's Vinegar. 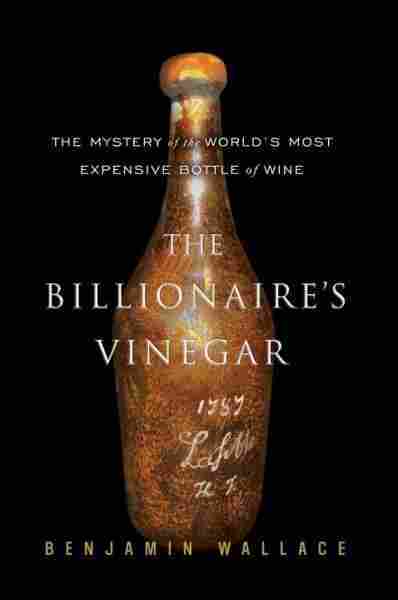 Benjamin Wallace's best-selling first book, The Billionaire's Vinegar, is at once a detective story and a sensational history — of wine, wine snobs and the most expensive bottle of wine ever sold. Wallace begins his story in 1985, when a 1787 bottle of Chateau Lafite Bordeaux was sold at auction for a record-setting $156,000. Rumors about the bottle's provenance began to swirl in the wine world. Did it truly come from a bricked-up cache formerly belonging to Thomas Jefferson? Was it part of a Nazi stash? Or was it a fake? As Wallace attempts to unravel the mystery, he introduces a cast of eccentric characters — billionaires, shady dealers and obsessed oenophiles -– along with their peculiar world of decadence and deceit. Movie rights for the book have already been purchased by Will Smith's production company. One producer told Variety, "For me, [it] is the unraveling of a mystery that comes down to a guy who punked the wine world." This reading of The Billionaire's Vinegar took place in May 2008 at the Politics and Prose bookstore in Washington, D.C.
A hush had come over the West Room. Photographers' flashes strobed the standing-room-only crowd silently, and the lone sound was the crisp voice of the auctioneer. To the world, Michael Broadbent projected a central-casting British cool, but under the bespoke suit, he was practicing a kind of mind control that calmed him in these situations. The trick was to focus narrowly, almost autistically, on numbers: lot number, number of bidders, paddle numbers, bid steps. Even after all these years, he still found it bracingly creative to conjure excitement out of a heap of dirty old bottles. No matter how many of them the fifty-eight-year-old Broadbent might see, he retained his boyish sense of marvel at the longevity of wine. Inert antiques were all very well, but there was magic in old wine--a mysterious and wonderful alchemy in something that could live and change for two hundred years and still be drinkable. Auctioneer was Broadbent's most public role, but it was only one of his distinctions in the wine world. In London he cut a familiar figure, pedaling to work each day on his Dutch ladies' bicycle with basket, legs gunning furiously, a trilby hat perched on his head. Often he was elsewhere, and he kept up a brutal schedule. As founding director of the Christie's wine department, he had spent the last two decades crisscrossing the planet, cataloging the dank and dusty contents of rich men's cellars, tasting tens of thousands of fine wines, and jotting his impressions in slender red hardcover notebooks. Those unassuming scribblings amounted to the most comprehensive diary of wine ever recorded. That diary now consisted of sixty of the Ideal notebooks, and he had collected them in a published tome that was the standard reference on old wines. Under Broadbent's direction, Christie's had largely invented and come to dominate the global market in old and rare wines. While Christie's as a whole was smaller than its great rival, Sotheby's, its wine department was more than twice as big, bringing in 7.3 million the previous season. Broadbent's peers in the trade acknowledged that his palate was the most experienced in the world. His pocket textbook on wine tasting, the definitive work of its kind, was in its eleventh edition, having sold more than 160,000 copies, and had been translated into eight languages. Any collector hosting an event that aspired to any seriousness made sure to invite Broadbent and his famously sensitive nose. When he arrived at a wine gathering, if so much as a trace of woodsmoke or the merest whiff of cigarette ash besmirched the air, Broadbent would scrunch up his nose, and everything would come to a halt while windows and doors were flung open. A lean six feet tall, Broadbent had a fringy sweep of whitening hair, and his smile, distinctly hail-fellow-well-met, was tempered by the cocked eyebrow of a worldly man. 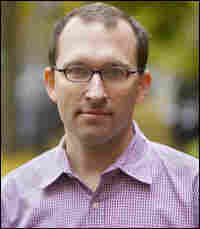 He looked more aristocratic than many of the dukes and princes alongside whom he sat on Christie's board of directors. When Broadbent tasted, he would lay his wristwatch next to his little red notebook, so that he could time the wine's changes in the glass. During lulls, if a piano was on hand, he might charm guests with some Brahms, or he might go off by himself to sketch the local scenery. He was happy to opine, at these tastings, on the wines under consideration. He had a knack for putting wine into memorable words. Sometimes he borrowed from literature, describing one wine as "black as Egypt's night." More often, he minted his own rakish descriptions, seeing a woman in every wine. A '79 P€trus reminded him of Sophia Loren: "You can admire them, but you don't want to go to bed with them." A double magnum of '47 Cantenac-Brown evoked chocolate and "schoolgirls' uniforms." The taste of the wine he was selling right now in London, just past 2:30 p.m. on Thursday, December 5, 1985, was impossible to know. December 5 had special meaning for Broadbent; it was the same date that James Christie, in 1766, had held the auction house's very first sale. Moments earlier, Broadbent had stepped up to the rostrum in a three-piece suit with a pocket square, and peered out at the room through his eyeglasses. Lot 337 was the first item of the afternoon session and had been carefully removed from its green felt berth in a glass case nearby. Lucy Godsal, a secretary in Broadbent's office, held the bottle aloft for the room to see. She looked very Christie's--blond, headband, pearl necklace--and Broadbent liked her; she was smart, hardworking, and pretty. Broadbent had never sold anything quite like this before. A Chateau Lafite from 1787, it was the oldest authenticated vintage red wine ever to come up for auction at Christie's. And that was the least of its merits. The bottle was engraved with the initials "Th.J." As Broadbent had described it in the auction catalog, "Th.J. are the initials of Thomas Jefferson." Almost miraculously, the bottle was full of wine and appeared to have survived two centuries intact. The container itself was beautiful and distinctive. "This is one time," Broadbent quipped to the crowd, "when the buyer will get something back on the bottle." The admittedly fragmentary tale of how the bottle had been found only added to its mystique. According to Hardy Rodenstock, the German collector who had consigned the bottle to Christie's, in the spring of 1985 workers tearing down a house in Paris had broken through a false wall in the basement and happened upon a hidden cache of extremely old wines. The Lafite, inscribed with the initials of the Founding Father, who had lived in Paris from 1784 to 1789 and was the foremost American wine connoisseur of his day, had been among them. The integrity of the seals, and the high fill levels, Rodenstock had told Broadbent, were remarkable for their age. The cellar had been almost hermetically preserved, its steady temperature in the sweet spot of 50 to 57 degrees Fahrenheit. Rodenstock theorized that the bottles had been walled up to protect them during the chaos of the French Revolution, and had lain undisturbed for two hundred years. Not surprisingly, Rodenstock refused to divulge the precise location, the exact number of bottles, or anything else about the discovery, despite Broadbent's entreaties. Rodenstock was the leading private collector in Europe, and he had already made a name for himself in rare-wine circles as an unusually skilled bottle hunter. Though he was a longtime customer of Christie's, Rodenstock was a competitor when it came to obtaining private cellars. Private-cellar purchases were often cash deals that went unreported to tax authorities. A certain reticence about his sources was to be expected. Broadbent felt there were a couple of possibilities. One was that the bottle had indeed been discovered during the excavations of the old Marais district in Paris, much of which had recently been torn up and redeveloped. A rumor less credited by Broadbent, and which he had no intention of putting in the catalog copy, was that the bottle had been part of some sort of Nazi cellar. Broadbent knew Rodenstock well, trusted him, and would not normally be too concerned with how he had obtained the bottle. But to Broadbent's annoyance, a historical researcher in America had recently been making noises in the press, questioning whether the bottle was in fact Jefferson's. Broadbent had conducted his own research and was satisfied that the circumstantial evidence argued overwhelmingly in favor of the attribution. He couldn't prove it, but on balance, the inducements to proceed outweighed any risk of embarrassment. The auctioneer's delight in an object that would sell itself accounted for only half of Broadbent's excitement. There was also the oenophile's anticipation, for Lafite was Broadbent's favorite wine. He loved the way it developed in the glass, revealing new depths and facets as it breathed. He thought Lafite the acme of elegance, a racehorse beside the thoroughbred of Mouton and the carthorse of Latour. But to open a bottle as old as this was to play roulette; Broadbent couldn't help wondering what it might taste like. And how to price such an object? When cataloging it for auction, Broadbent gave the estimate as "inestimable." He was rather pleased with his pun. A number of commission bids--those placed in advance by bidders who could not, or didn't want to, attend--had come in. Chateau Lafite-Rothschild, modern successor to the eighteenth-century vineyard, had placed a 5,000 bid; this had been so eclipsed by other advance bids that the Chateau was out of the running before the session even began. Broadbent could feel confident that a new single-bottle price record was about to be set. In the West Room, he opened the bidding at 10,000. At first the bids came slowly, moving in 2,000 increments. A paddle would rise here. Another would bob up there. But things quickly heated up, and soon several people were raising paddles at every step. Broadbent knew everyone in the London trade, and many of them were here in this room, but he reserved his greatest expectations for the Americans. The Jefferson connection, the strength of the dollar (it had hit a historic high earlier in the year), recent auction history--all these factors would surely tempt a deep-pocketed Yank to repatriate the bottle. Marvin Shanken, publisher of the magazine Wine Spectator, was here today, but Broadbent's highest hopes were aimed at the fellow who sat left of the center aisle from where Broadbent stood: Christoper "Kip" Forbes, the thirty-five-year-old son of publisher Malcolm Forbes. Broadbent didn't think much of Malcolm Forbes, finding him to be a mean sort of chap. He knew that the American publisher collected first growths, the top-ranked Bordeaux reds, though only in lousy vintages. But it was undeniable that Forbes had money and would spend it for something he wanted, and Kip soon entered the bidding. The price volleyed remorselessly to 20,000, then 30,000. At 40,000, it seemed, fleetingly, that a cap might have been reached, but the bidding resurged. Only after Kip Forbes bid 50,000--$75,000--did all the other paddles stay down. This was a new record for a bottle of wine, by a wide margin. The previous record, set the year before at an auction in Dallas, was $38,000 for a Jeroboam (equivalent to six bottles) of 1870 Mouton-Rothschild; the record for a normal-size bottle was $31,000, paid in 1980 for an 1822 Lafite. Today's price now far exceeded Broadbent's most wishful imaginings. He felt vindicated by his decision to go ahead with the sale. He began the ritual countdown. "Any more?" He scanned the crowd for takers. "Any more?" Again Broadbent looked around the room, daring the bidders with his eyes to outdo Forbes. Nothing. Then, at the rear of the room, he saw a movement. Excerpted from The Billionaire's Vinegar by Benjamin Wallace Copyright © 2008 by Benjamin Wallace. Excerpted by permission of Crown, a division of Random House, Inc. All rights reserved. No part of this excerpt may be reproduced or reprinted without permission in writing from the publisher.